This year’s Crosby Army ROTC Scholarship was presented to Cadet Mitchell Phelps. The ROTC Awards Ceremony was held in a new location this year, in the Henderson Building on the Embry-Riddle Aeronautical University-Daytona Beach campus. Beautiful building, but when my husband and I walked into the lobby we saw the most elegant young cadets dressed in their “dress blues” mingling before the ceremony. This is the first time the cadets were dressed in their finest for an award ceremony. I’ve seen them in their Army green dress uniforms and in the camouflage uniforms, but never in their dress blues. 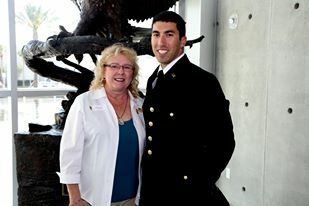 Cadet Phelps was not graduating this year as he was working on a project that would take him through another year. This young man is a genius in engineering and physics. He was working on a rocket launching project that is sure play a part of our nation’s future. The intelligence of these ROTC cadets never ceases to amaze me. There is nothing like being among Army cadets who love their country and are some of the smartest people in the world. Our future is certainly in good hands with these young folks.